Someone who reads my column this week might wish the police would pick on drug importers a little more menacing than Santa's Helper. For the record, they do. I tell the story of Michelle DiGiacomo, whose Direct Effect Charities connects thousands of Chicago's neediest children with benefactors who provide them with Christmas presents and necessities such as socks and underwear. DiGiacomo suffers from an assortment of physical ailments that she believes would keep her in intolerable pain were it not for medical marijuana. But when a shipment of pot arrived from California last month it was closely followed by officers of the CPD's Package Interdiction Team. They busted down the back door to my apartment building, pointed guns in my neighbor's faces and made it up to my apartment. They were looking for guns, money and packaged drugs for sale. 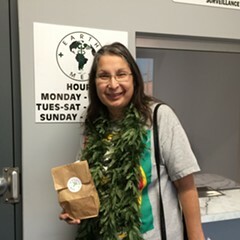 What they found was my personal, medicine; marijuana . . . . One agent asked me if I worked and I told him I was disabled. His reply was 'so what, a lot of disabled people work!" to which I replied that I can no work due to my disabilities but I do a great deal of charity work as I can do it from home. 'yeah right, sure you do' was his response. . . .Another agent was screaming at me asking where the money was. I told him I did not have any. He said he would get dogs and I again told him I did not have money. He ripped my purse apart and took out my wallet. He went through it and pulled everything out of it. He opened a zipped pocket that holds a small urn with my husband's ashes and a $5 bill that was in his wallet when he died. He threw it down and screamed 'why don't you have any more money than that?!' I cried back to him that I had spent all the money I had on fast food the night prior. He was very angry. The Package Interdiction Team is a task force that finds Chicago cops working in conjunction with U.S. postal inspectors and delivery services such as Federal Express. The raid on DiGiacomo's apartment didn't make the papers, but another operation a few days earlier did. 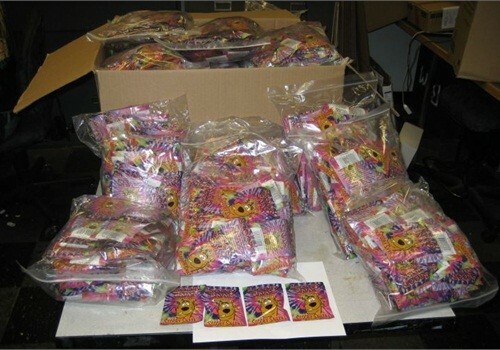 The interdiction team reported intercepting a shipment of synthetic marijuana en route to Chicago wrapped in cheerfully colored foil packets that said "Scooby Snax 4G" and sported a picture of the famed cartoon crime fighter Scooby-Doo. "My granddaughter, who's 12 years old, asks to buy bubble gum chew off the shelves at Walgreen's that looks like the same damn bag they're selling synthetic weed in," said Sergeant B. Williams of the interdiction team. (He led the raid on Michelle DiGiacomo.) "If you want to take pictures of these packages I've got 'em in my office. I'm really hot on this stuff. Kids are dying." Police said they confiscated more than 16,000 grams (roughly 37 pounds) of synthetic marijuana with an estimated street value of about $265,000. (There were no arrests.) DiGiacomo is charged with possession of 670 grams of pot.